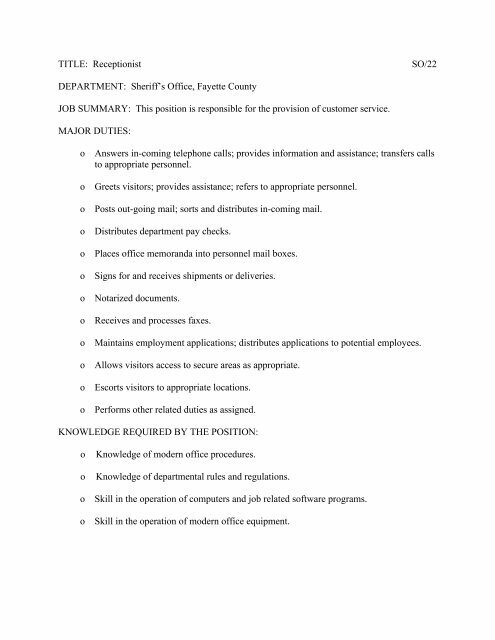 TITLE: Receptionist SO/22 DEPARTMENT: Sheriff’s Office, Fayette County JOB SUMMARY: This position is responsible for the provision of customer service. MAJOR DUTIES: o Answers in-coming telephone calls; provides information and assistance; transfers calls to appropriate personnel. o Greets visitors; provides assistance; refers to appropriate personnel. o Posts out-going mail; sorts and distributes in-coming mail. o Distributes department pay checks. o Places office memoranda into personnel mail boxes. o Signs for and receives shipments or deliveries. o Notarized documents. o Receives and processes faxes. o Maintains employment applications; distributes applications to potential employees. o Allows visitors access to secure areas as appropriate. o Escorts visitors to appropriate locations. o Performs other related duties as assigned. KNOWLEDGE REQUIRED BY THE POSITION: o Knowledge of modern office procedures. o Knowledge of departmental rules and regulations.  o Skill in the operation of computers and job related software programs. o Skill in the operation of modern office equipment.